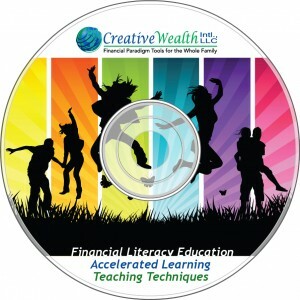 The fact is…most financial education curriculums are boring, and boring means ineffective. If kids aren’t paying attention, they aren’t learning and there’s nothing more boring than financial education lessons where you talk, they’re supposed to listen and then you have them fill out some type of worksheet. Even adults would be bored. At Creative Wealth, we’re been using accelerated learning techniques in our Camp Millionaire and Money Game programs since 2005 and oh, what a difference they make. The kids have such a great time they can’t wait to come back the next day. Experience before content: the way you were taught was wrong. If you tell them what you’re going to teach them and they don’t want to learn that, you’ve lost them. Learn this amazing philosophy to keep them guessing and having fun while they learn. Our financial literacy programs work for two reasons: WHAT we teach is different, compelling, engaging and relevant and HOW we teach locks in the lessons the first time. Our students rarely take notes and remember so much…just ask their parents about the conversatoins they have on the way home and for months to come. COST: $99 for everything you need to turn your financial education curriculums (or any other curriculum for that matter) into so much fun that your students can’t wait to come back the next day to learn more. CLICK HERE TO ORDER to learn how to engage your students with every lesson, no matter what you teach!